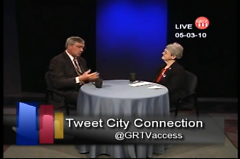 At 5 p.m. Monday night, Mayor Heartwell's live interactive public access show City Connection was simulcast right here on The Rapidian. This episode marked the return of City Connection's longtime co-host Sr. Barbara Hansen, making her first appearance on the show in quite some time. City Connection is an opportunity for Grand Rapidians to talk with our mayor about important city issues. And with a month that has included everything from controversial city council decisions in Holland, several violent crimes culminating in last Thursday's city-wide turmoil (read Mayor Heartwell's comments here), and an impending visit from the Westboro Baptist Church, there were lots of things to talk about. City Connection serves residents who have any questions or anything they would like to say to Mayor Heartwell. 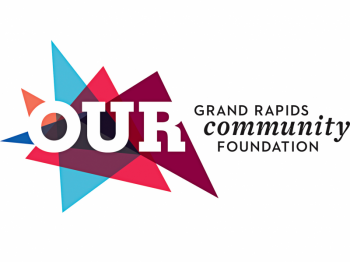 Grand Rapidians are encouraged each month to do so on the article, emailing [email protected], tweeting @GRTVaccess, or leaving a Facebook comment. Tune in on the first Monday of each month at 5 p.m. to hear him respond to you live on GRTV’s Livewire (channel 24 on Comcast) and streaming on The Rapidian. I heard about the people who have recently been taken to court in Oak Park, MI for their front-yard garden. What are the implications of lawsuit for the "urban homesteaders" here in Grand Rapids? This morning in the Heartside Neighborhood Collaboration Project meeting, several heartside nonprofit executive directors showed concern about your public response to the shootings last week. Their feeling was that the response was intended to mitigate damage to the public image of Grand Rapids (on a regional or national level) more then to help the community address the damage this event may have done to the citizens of the city. Please respond to their concern.